Chimney FAQs | Chimney Services | Chimney | Kent Chimney Inc.
During our chimney service visits, we get a lot of questions from customers about how to maintain the chimneys and fireplaces in their homes. To eliminate any confusion, we’ve compiled a list of the most frequently asked questions we get so you can feel informed and confident while seeking chimney repairs. Creosote is the black or brown residue that builds up inside your chimney flue when you burn a fire. Since creosote is a highly flammable material, you’ll need to schedule a chimney cleaning once a year to make sure it doesn’t build up to dangerous levels and cause a chimney fire. Why does a chimney deteriorate? While a chimney may look like it’s in good condition from the outside, the inside can be a different story. One of the main culprits of chimney damage is moisture inside the flue. When gas temperatures drop below 120 degrees in the flue, this creates condensation. Condensation inside your chimney can cause the flue tiles to rust or even crack. A cracked chimney flue will need to be replaced as soon as possible to prevent carbon monoxide from leaking into your home. You’ll need to schedule chimney sweeping for once a year. Our chimney sweeps will make sure all fire residues are cleaned from the flue liner, damper, smoke chamber, and firebox. 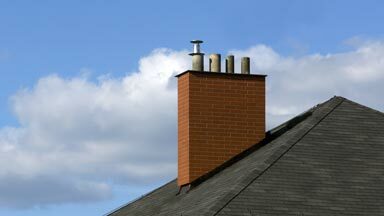 Chimneys need to be swept to prevent creosote, tar, and soot from building up to dangerous levels. Leaving these flammable residues inside the flue increases your risk for a chimney fire. Do I need my fireplace inspected if I never use it? Yes, especially if you plan on using your fireplace again after several years of inactivity. We recommend having your fireplace inspected once a year to ensure it is in working order. Service visits allow our chimney inspectors to catch small issues before they grow into expensive chimney and fireplace repairs. Why does my chimney and fireplace smell? It’s normal for fires to produce smells. However, these smells shouldn’t be wafting into your home. When you burn a fire in your fireplace, the updraft inside the chimney flue is strong enough to carry the odors outside. For this reason, you may notice the odors entering your home when the fire starts to die down and the updraft loses strength. A simple solution is to have one of our chimney contractors install a glass fire screen. What do I do if there’s an animal in my chimney? Since chimneys function much like a hollow tree, it’s no wonder why they attract wildlife. To a mother raccoon, your chimney is the perfect place to rear her young. If you suspect a raccoon family has moved into your chimney, don’t be alarmed. The mother raccoon will move out of your chimney as soon as her young are old enough to leave the den (usually a few weeks). Birds can also accidently fall in and became trapped. Consult with a wildlife protection organization in your area to determine the best method of rescue. Do NOT try to light a fire to smoke them out. This will only result in you injuring or killing the animals. To prevent future animals from getting into your chimney, we can install a critter cap. Kent Chimney Inc. is a chimney repair company dedicated to keeping chimneys safe for homeowners. If you have any questions not answered above or are interested in our chimney sweep services, give us a call at (616) 949-7722.